City vendors are important members of the community, and it's important that citizens have the capacity to provide feedback as a measure of quality control. 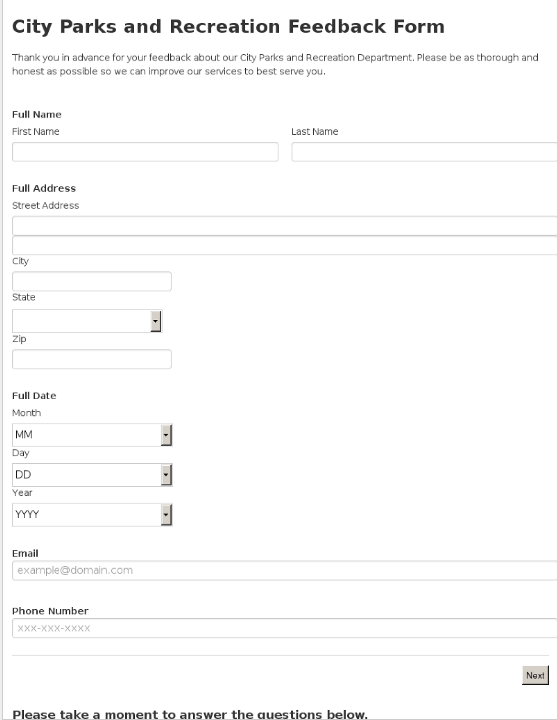 Use the City Vendor Feedback Form to enable citizens to evaluate vendors who provide goods and services from the city. County vendors are important members of the community, and it's important that citizens have the capacity to provide feedback as a measure of quality control. 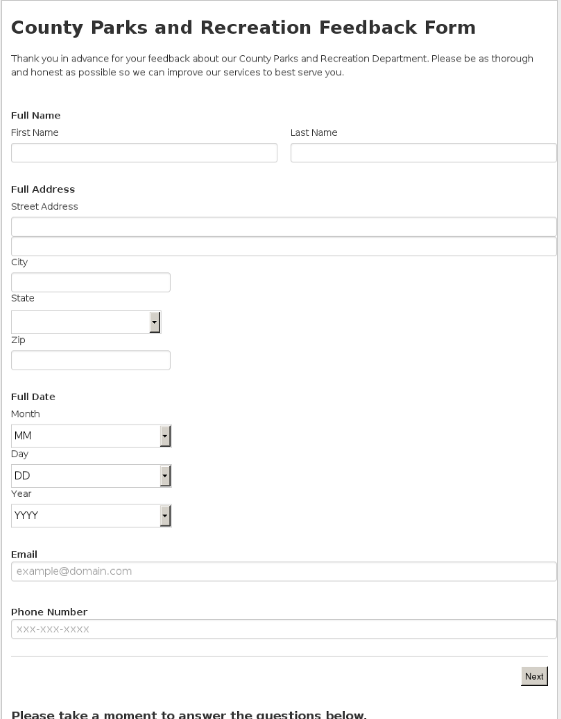 Use the County Vendor Feedback Form to enable citizens to evaluate vendors who provide goods and services from the county. Each and every County Parks and Recreation Department needs to get feedback from its citizens to more effectively improve their service for the general public. 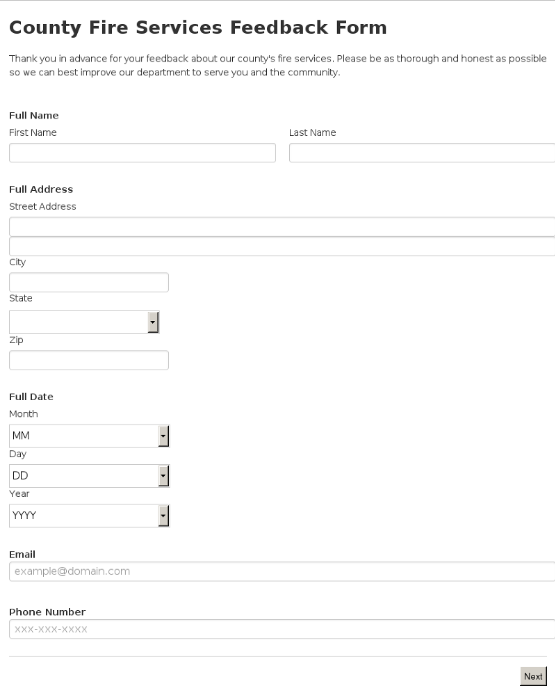 Use the County Parks and Recreation Department Feedback Form to gain insights into the service you provide to citizens, and to better understand the ways you can improve to best serve constituents. Each and every City Parks and Recreation Department needs to get feedback from its citizens to more effectively improve their service for the general public. 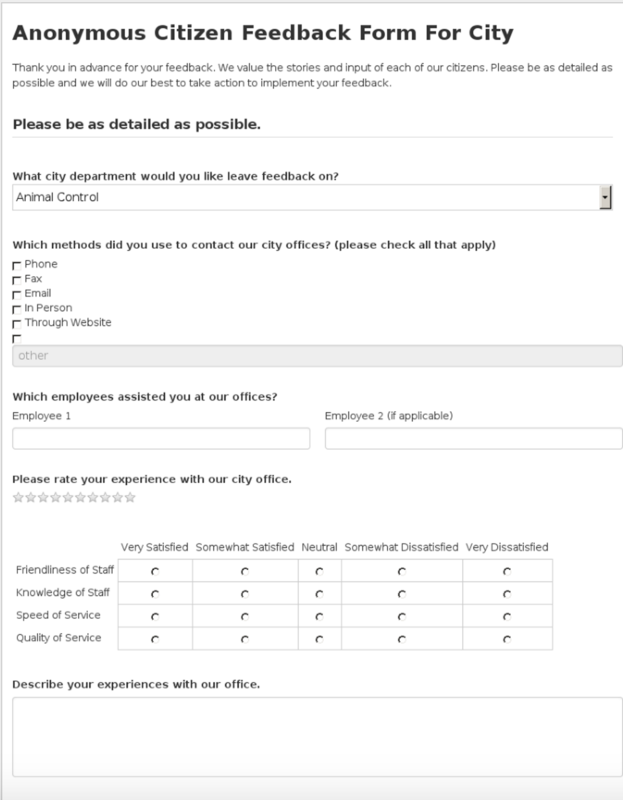 Use the City Parks and Recreation Department Feedback Form to gain insights into the service you provide to citizens, and to better understand the ways you can improve to best serve constituents. Fire services protect the lives of averages citizens each and every day, which is why it's imperative for cities to know exactly how effectively this service being delivered to constituents. 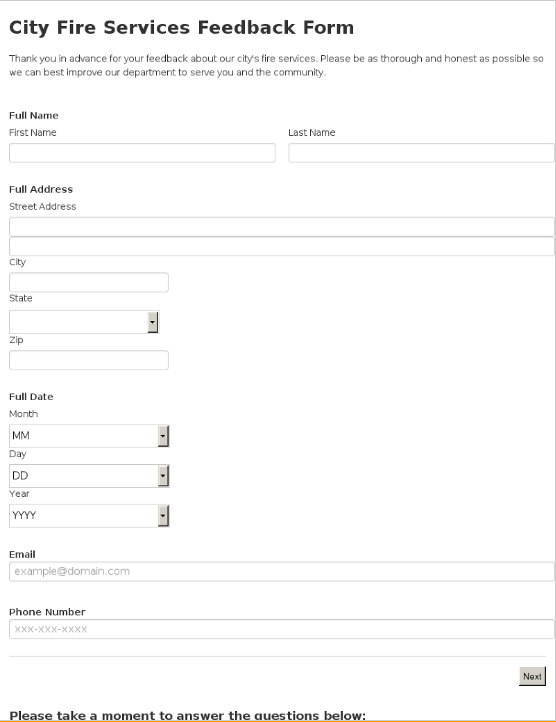 Use the City Fire Services Feedback Form to elicit the feedback of citizens who have come in contact with members of the fire department, and quickly identify areas for improvement. Fire services protect the lives of averages citizens each and every day, which is why it's imperative for counties to know exactly how effectively this service being delivered to constituents. 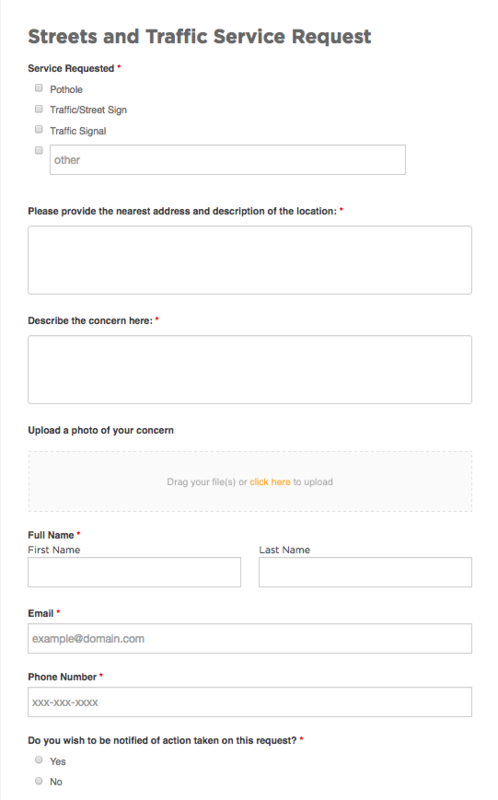 Use the County Fire Services Feedback Form to elicit the feedback of citizens who have come in contact with members of the fire department, and quickly identify areas for improvement. Environmental safety is an important part of county safety, and it's imperative that citizens have the ability to voice concerns directly with the county. 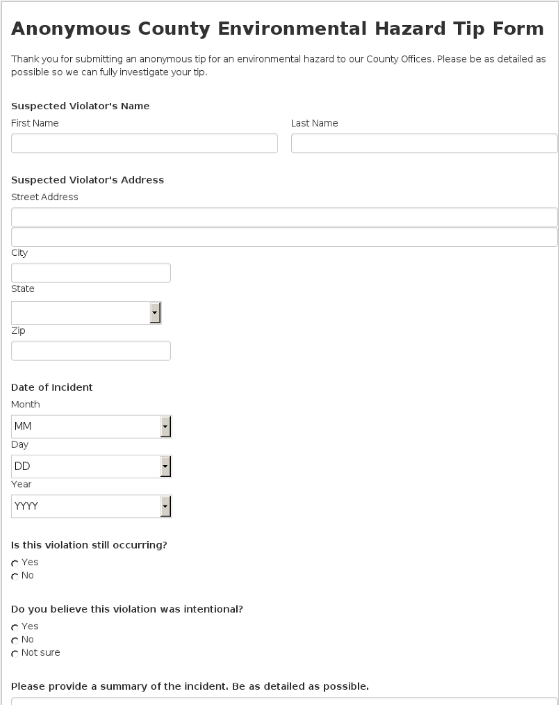 Use the Anonymous County Environmental Complaint Form to enable citizens to anonymously submit an environmental complaint to the county. As the year comes to a close, asking citizens about their experiences with your county government and as members of the community is a great way to start the upcoming year. 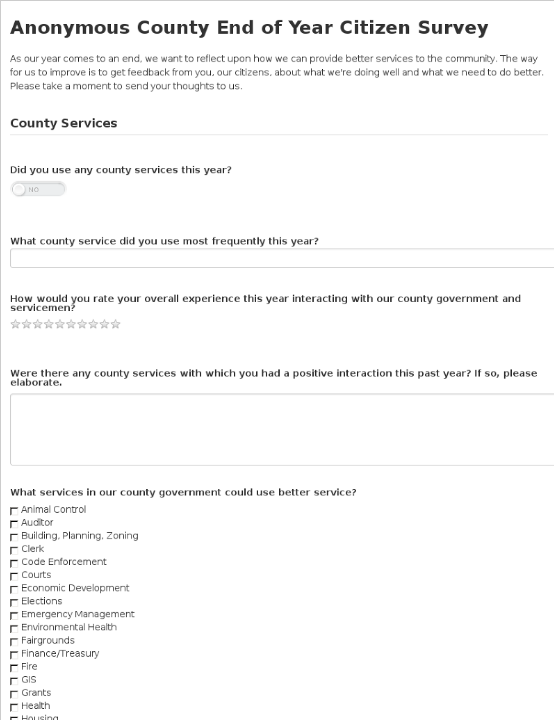 Use the Anonymous County End of Year Citizen Survey to get valuable anonymous feedback from your citizens to help your government make improvements next year. Environmental safety is an important part of city safety, and it's imperative that citizens have the ability to voice concerns directly with the city. 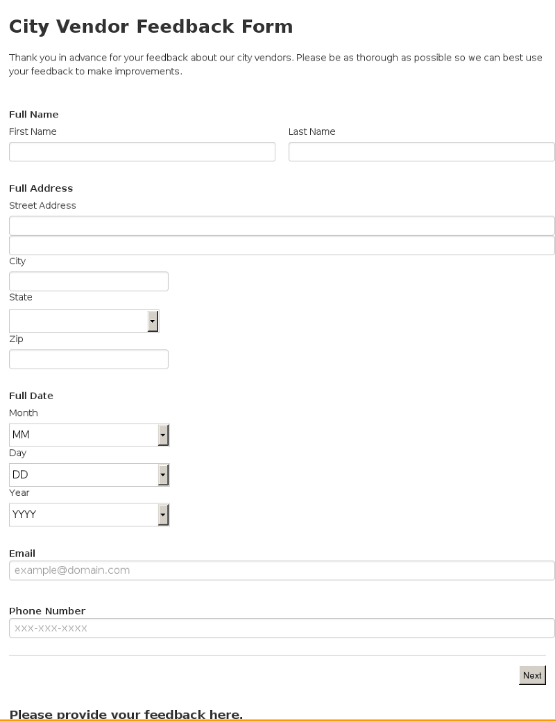 Use the City Environmental Complaint Form to enable citizens to anonymously submit an environmental complaint to the city. As the year comes to a close, asking citizens about their experiences with your city government and as members of the community is a great way to start the upcoming year. 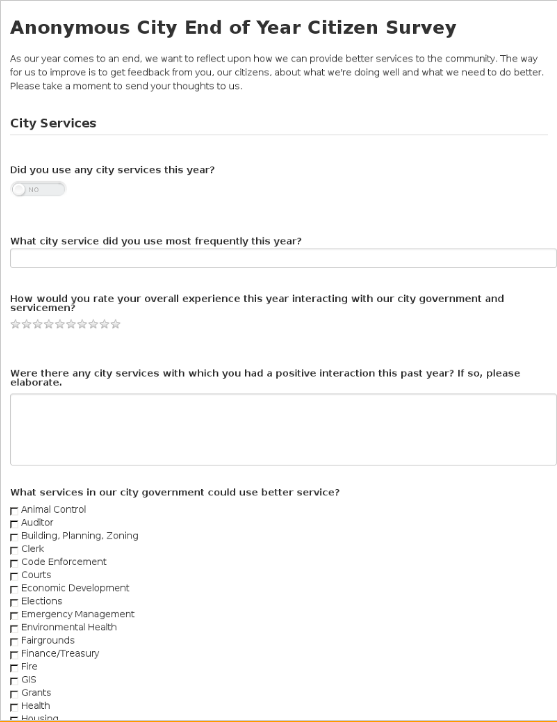 Use the Anonymous City End of Year Citizen Survey to get valuable anonymous feedback from your citizens to help your government make improvements next year. 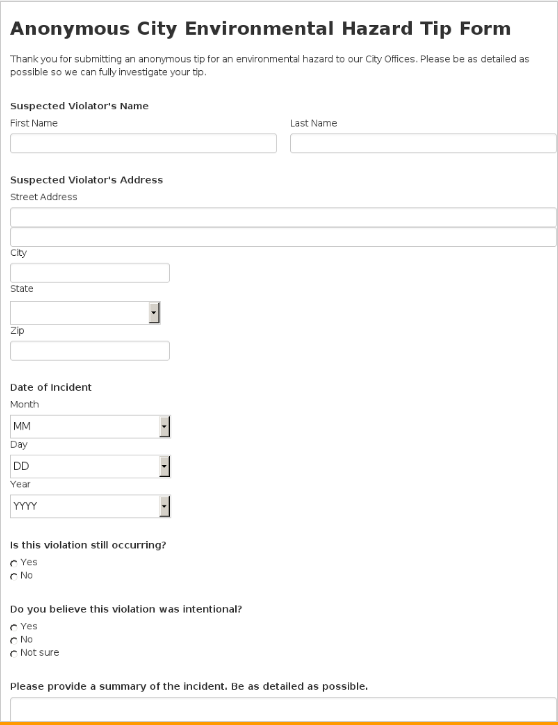 This form will allow cities to collect requests to fix street potholes, signals, and signs. Citizen feedback is the best way to improve government services and provide citizens with the treatment and support that they deserve. 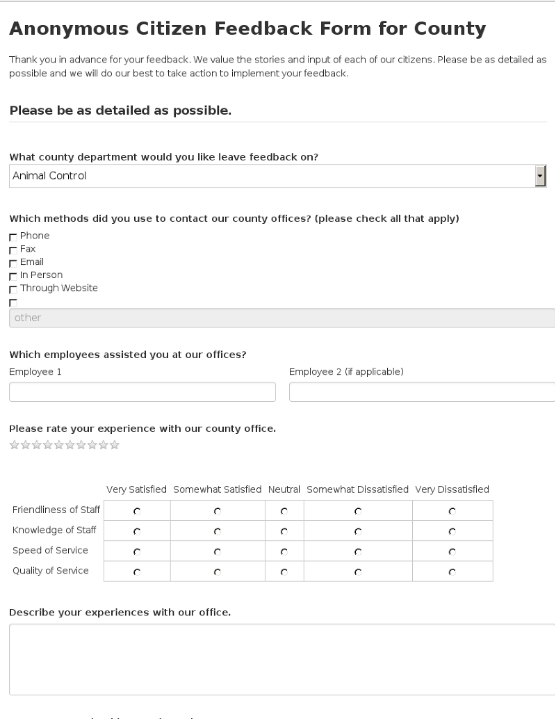 Use the Anonymous Citizen Suggestion Form for County Government to allow citizens to anonymously give feedback on their unique experience with your county government. Citizen feedback is the best way to improve government services and provide citizens with the treatment and support that they deserve. 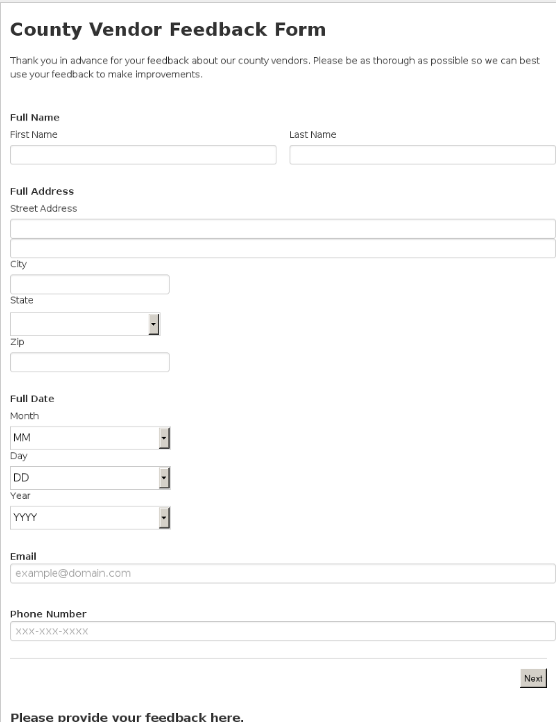 Use the Citizen Feedback Form for City Government to allow citizens to anonymously give feedback on their unique experience with your city government.